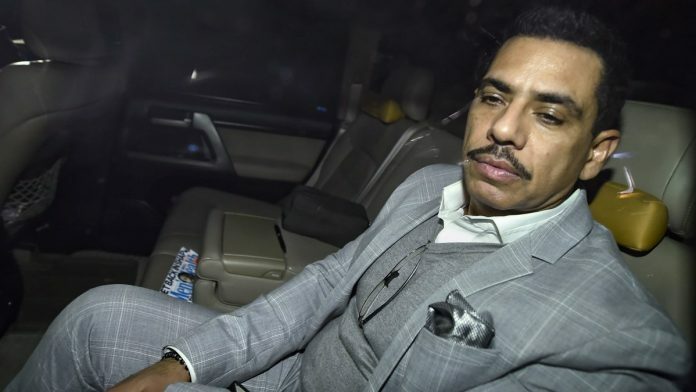 Robert Vadra is the front page news of the today, for two reasons that seem equally important to the media: to be questioned by the Enforcement Directorate (ED) over alleged money laundering and for being accompanied by Priyanka Gandhi Vadra, his wife. The latter gets more spin. The Times of India’s headline highlights the importance of being Priyanka, in the story: ‘In 1st public appearance as neta, Priyanka backs Vadra,’ it writes, standing by him is “seen as a political statement and an expression of solidarity”. The page 1 report deals only with Priyanka’s “first public appearance after assuming a political role” and ignores the ED case or interrogation of Vadra. The Indian Express is more straightforward in its second-lead, “ED questions Vadra over his ‘links’ to arms dealer and London properties.” It adds that according to his lawyer, Vadra “had answered all questions and was innocent”. The Hindu’s ‘ED questions Robert Vadra in money laundering case’ expands on Vadra’s viewpoint, writing that in his earlier bail plea, Vadra claimed he was innocent and “subjected to unwarranted, unjustified and malicious criminal prosecution which on the face of it is completely politically motivated”. The Hindustan Times’ lead is ‘Temple trust changes its stand on the entry of women’. The same board that fought to keep “menstruating” women out of the temple has now changed its mind, “a surprising volte-face from its previous stance,” it writes. The Hindu, however, ignores this dimension to the court proceedings. In ‘Bench reserves orders on Sabarimala review petitions’ (page 1 lead) it outlines the arguments presented by some of the 65 petitioners who “challenged the authority of the court to intervene in a centuries-old belief”. On the death of the two IAF test pilots in Bengaluru’s HAL airport last week, HT reports that they “may have been caused in part by arrester barriers, critical airfield safety equipment, giving way”. Express keeps a close eye on the elevation of judges. In ‘Govt blocks proposal on judge for J&K, SC Collegium asks why’, it says senior Additional Advocate General Sadiq Nargal had been recommended last year but “the Law Ministry returned the recommendation, and a year later, is yet to say why”. While opinion remains divided, TOI and Business Standard look at the larger political discourse prior to elections. TOI finds BJP and Congress have much in common, politically, in ‘Political Paradox’ while BS assails the Opposition’s lack of a coherent agenda: ‘…wake up and smell the coffee,’ it advises in ‘Premature Assumptions’. HT and Express find common cause with editorials on VHP’s decision to “not agitate or mobilise for the construction of the Ram temple in Ayodhya…till Lok Sabha elections are over (Express, ‘Welcome Step Back’)”. Express says the decision “is immensely welcome. It is also a retreat”. It may have been taken because the VHP realised “the fervour which framed” the mandir issue “has dissipated”. “Or, it could be… the ‘fringe’ has bowed to the counsel from the more mainstream shades of political saffron”. HT in ‘Logic Behind the VHP’s decision’ argues differently. The decision “stems from a recognition of the limits imposed by India’s political, constitutional and legal framework”. There has been a “concerted move” by the Sangh parivar to “build pressure for the temple” but since the SC was hearing the case “at its own pace”, unaffected by “political timelines’, the BJP government, recognising the pitfalls of “bypassing” the court, asked SC for a return of “excess land” to the original owners, including the VHP-backed Ram Janmabhoomi Nyas — “The VHP had a face saver,” explains HT. It was all about `Priyanka ka Haath Robert ke saath’ (Times Now, CNN News 18), Wednesday afternoon onwards, following `Mr and Mrs Vadra’ as Republic called them, arrival at the ED offices. In a ‘scoop never seen before’, according to Kumar, Times Now showed five properties in UK, allegedly owned by ‘damaad’ with the individual addresses of the houses, costs and locations. Tehseem Poonawalla, who was introduced by Kumar “as someone who always defends Robert Vadra” argued that the “the 11 Branston Square house… hasn’t been sold since 2005… this is a fake story by the Enforcement Directorate. And (the) 26 Wellington Road house, a quick check on the London Registry, it was sold in August 2018 and the owners are nowhere close to Robert Vadra”. BJP national spokesperson Sambit Patra was unimpressed: “No thief will come out with his crimes on his own. Truth has this uncanny habit of propping up itself’’. This is all part of “the first family”, which means “corruption”, he added. Lawyer Farookh Khan annoyed Kumar by saying that if “you are showing these e-mails as true… (if) you are testifying they are true.. file an application”. Kumar interrupted, reminding him that she had said these were “alleged by the ED”. Republic TV anchor Arnab Goswami chose to discuss the Gandhi family’s reported move to defame the Indian Army by spreading rumours of an impending army coup against the Manmohan Singh-led UPA II government in 2011-12. Earlier in the day, a story, based on a Sunday Guardian 2 February report, was circulated by BJP and found its way onto Times Now and Republic. G.V.L. Narasimha Rao, BJP national spokesperson and Rajya Sabha MP, earnestly explained how this was a conspiracy against the Indian Army: “Even in 2012, when this story came (out), no one believed because everyone has respect for the army. This seemed like a conspiracy against the army”.